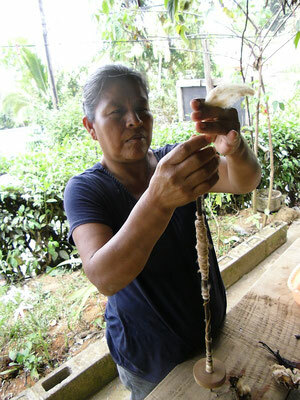 PUBLISHED ARTICLES - CONTENTS - - Boruca, indigenous of Costa Rica. Basic, crude, primitive – these are all words that may come to mind when one thinks of the humble backstrap loom – a description that obscures the fact that some of history’s most beautiful and complex textiles have been woven on this simple arrangement of sticks. 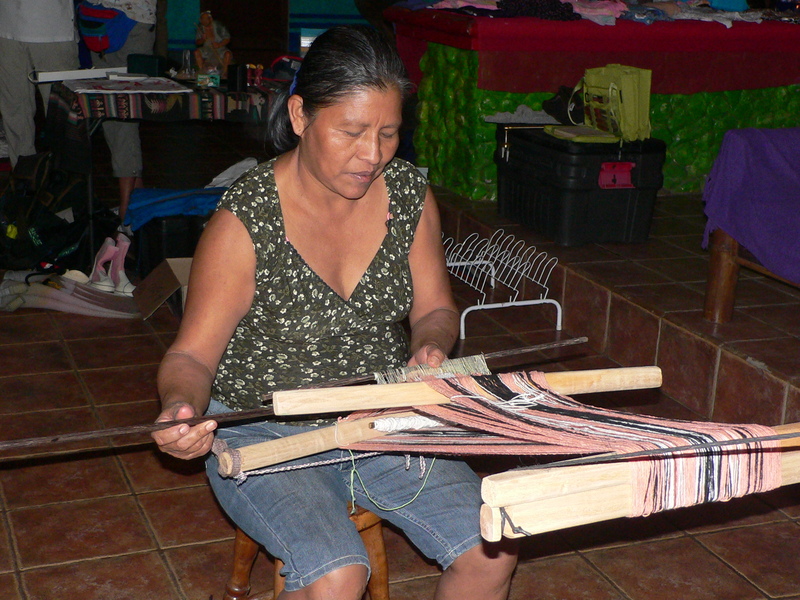 The backstrap loom is a very ancient type of weaving device. Although this loom may pre-date history, it is still in use today. It is very portable. It can be set up and used almost anywhere. A backstrap loom is basically two sticks between which the lengthwise threads (warp) are stretched from a fixed device such as a post or tree to a belt that a person wears around their waist. By backing away from the post or tree, the user can pull the warp threads into tension. Two more sticks strategically placed in the middle allow you to manipulate the warps to create sheds, an opening for the horizontal threads (weft) which holds everything together; the weft is carried with a shuttle and beaten into place with a flat wide piece of wood similar to a comb in shape. By repeating this process, fabric can be woven. There are some limitations to backstrap weaving. It is difficult to weave a very long piece of fabric, or wider than the body width. Despite this, the Borucans weave beautiful naturally dyed cloth. You can make a daytrip to the Borucan village to see a weaving and dyeing demonstration, and purchase beautiful woven products; if that is not doable, you can shop at the Boruca Gallery Gift Shop. 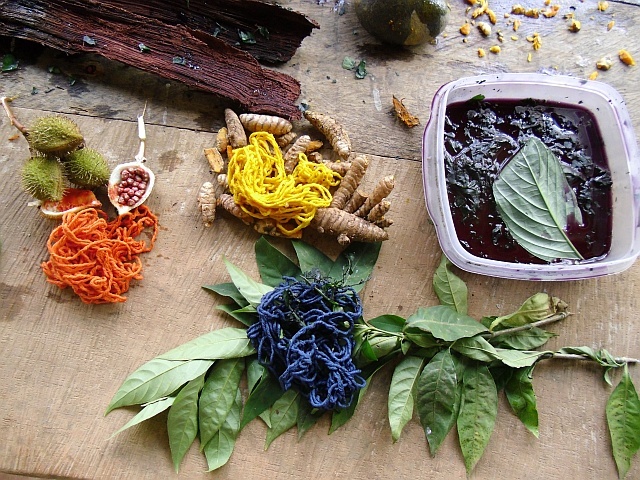 Did you know that a great source for natural dyes can be found right in your own yard? Leaves, roots, nuts, flowers, barks, berries, lichen and fungi are just a few natural ways to get many colors. Yellow, orange, blue, red, green, brown and grey are all on the color pallet used for dyeing fabric or yarns. The essential process of dyeing has changed little over time. Typically, the dye material is put in a pot of water and the yarns to be dyed are added to the pot, which is heated and stirred until the color is transferred. Many natural dyes require the use of mordants to bind the dye to the textile fibers. The ones used by the Borucans are salt or lime/mandarin orange. The examples in the photos are: Orange is from the seeds of the achiote bush (Bixa orellana). Yellow is from the rhizomes of the Tumeric plant (Curcuma longa) that is smashed, can become fixed and more vibrant with the addition of lime. Green is from the leaves of Gavilana (Neurolaena Lobata) that are boiled for several days to get the green color. Blue is from the leaves of Azul de mata (Justicia tinctoria), similar to indigo. 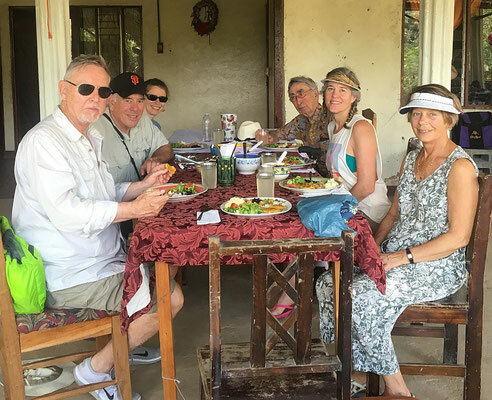 If a trip to the village of Boruca (to see the fine woven goods made with the naturally dyed cotton yarns) isn’t an option, then visit the Boruca Gallery Gift Shop at Pacific Edge Cabins in Dominicalito. The Many Depths of Art…. 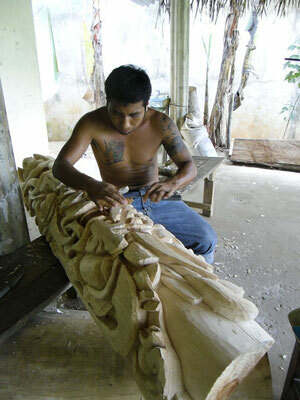 Our local Costa Ballena indigenous Indians, the Borucans have become thru the years very detailed relief carvers. Relief carvings have a flat back and the image carved in three dimension obtaining unbelievable depths all from one piece of wood. 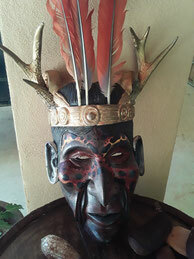 Traditional carved masks are made from two types of wood, cedar and balsa. There are three distinct styles and each tells a specific story about Borucan culture. The first is the 'diablito' or 'devil' mask. It is the most traditional, dating back to the Spanish Occupation. The second is the 'ecologica', featuring animals and plants of the rainforest, and these were originated by a new generation of artists concerned about the imminent threat of their culture due to the destruction of their environment. The third, 'combinados', are the metamorphosis of both the 'diablitos' and the 'ecologica', as they represent the blending of the traditional and contemporary styles. The masks start out with a log of either balsa wood or cedar. After removing any bark, the log is cut a bit longer than the final length of the completed mask. This log is then cut vertically to produce two half round pieces, and the interior is hollowed out with a chisel and mallet. Next, the rounded front of the mask is hand sanded to a smooth surface and the design is sketched onto the wood. The artists now begin to remove the negative background area, slowly creating a high relief three dimensional face. 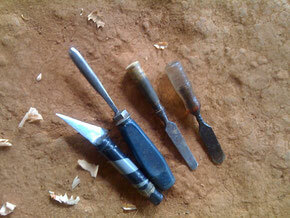 For the fine details, exacto-type knives are used to whittle away the unwanted wood. 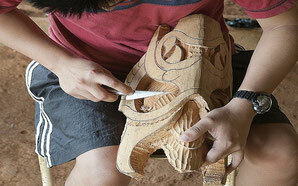 Cedar is very hard and difficult to carve, therefore the masks made from this type of wood are not quite as detailed. Conversely, balsa wood is very soft, and these are the masks where the artists can really achieve the many nuances of facial expression. These beautifully carved masks can be seen by either a visit to the village of Boruca (about 2 hours one direction), or here locally at Boruca Gallery Gift Shop who carry a large collection. Lunch with Culture, it’s Gluten Free! Want to experience something different? Try having lunch with our local indigenous Indians, the Borucans. You can do this with a doable day trip to Boruca, (see our website for directions, www.borucacostarica.org). The Borucans are mostly self-sufficient in that they grow most of their produce, beans, corn and fruits, as well as raise their chickens and pigs. Everything is cooked from scratch, no processed foods here! 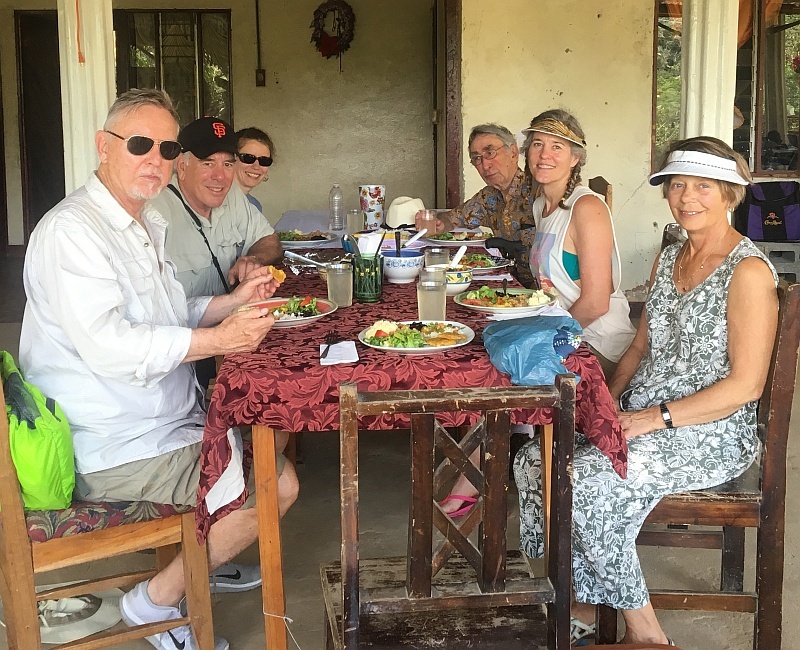 On a resent 2 day trip to Boruca, we had delicious chicken cooked in a homemade achiote sauce, a yucca dish, and a fresh green salad. Another meal, we had pasta with marinara sauce, rice and beans, and delicious patacones, (a fried green plantain). Of all the meals, my favorite was Marina’s empanadas. They were absolutely fantastic! Most empanadas are made with wheat flour, but Marina uses dried corn kernels, soaked, cooked and then put thru a food mill to make the masa (dough) for her empanadas, (This is how they can be gluten free!). This corn flour makes a superb flavor. 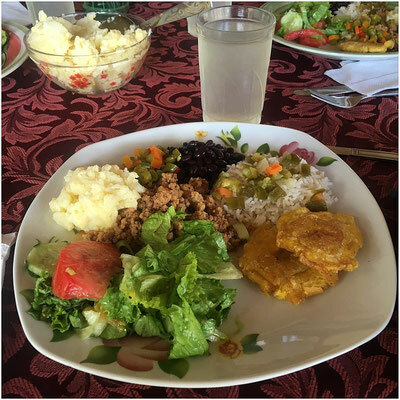 She stuffs the empanadas with various fillers: chicken, red or black beans, potatoes with chicken or hamburger or like the way we had them – filled with just potatoes, sautéed onions, garlic, sweet red bell peppers and achiote paste. Yummy! A visit to Boruca could include a tasty empanada lunch if Marina is given advanced notice. They would be served with a salad and refresco. Her homemade empanadas are a culinary delight! You can also spend the night in bedrooms, in Marina’s house, that are set aside for guests. This needs a few days pre-arrangement. They are basic rooms, no Hilton here, however you get to experience the native village along with the crowing roosters. Go visit! 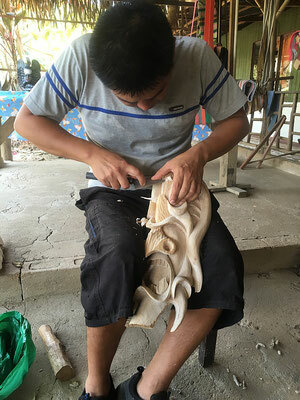 Are you wanting a unique souvenir of your trip to Costa Rica, something authentic that doesn’t have the ‘Made in China’ stamp on it? The perfect gifts would be ones made by one of the eight indigenous groups of Costa Rica, the Borucans. The Borucans, are our local indigenous, who live on the ridge top above the southern Costa Ballena area. The Borucans support themselves by their fine craftsmanship, of woven and carved products, both of which are one of a kind. The carved masks date back to the days of the Spanish conquistadors when the Borucans wore devil looking masks to defend their land from invasion. The masks are made from a light balsa wood or a harder cedar, hand painted and signed by the artist. The woven products are all made on the back strap loom, which ties to the body of the weaver at the waist and the other end fixed to a post, therefore the finished fabric can only be the width of their body. The weavings are of 100% cotton, and colored with only natural dyes of leaves, seeds, barks, and sea snails. They are used to make tote bags, table runners and placemats, to name a few. So the perfect gifts and souvenirs can be found right here in the Costa Ballena. A day trip to Boruca is doable as it is only 2 hours away, (a 4 wheel drive vehicle is needed). 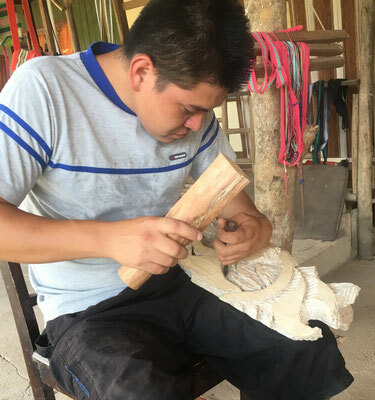 Or you can also see a wide variety of the best handcrafted items which are sold at a fair trade price at the Boruca Gallery Gift Shop, located at Pacific Edge Cabins in Dominicalito. The Borucans, have been weaving on back strap looms as far back as their recorded history. In the Costa Ballena area, archeologists have found evidence of its being populated dating back to 1500 B.C. The back strap loom is a crude loom consisting of a few sticks. It was very portable and could be set up anywhere to create woven material used for simple clothing and their hammock beds. Grandmothers passed on the art of weaving, spinning and dyeing the yarn to their daughters. This was all very time consuming, but was considered a basic daily chore in their households. 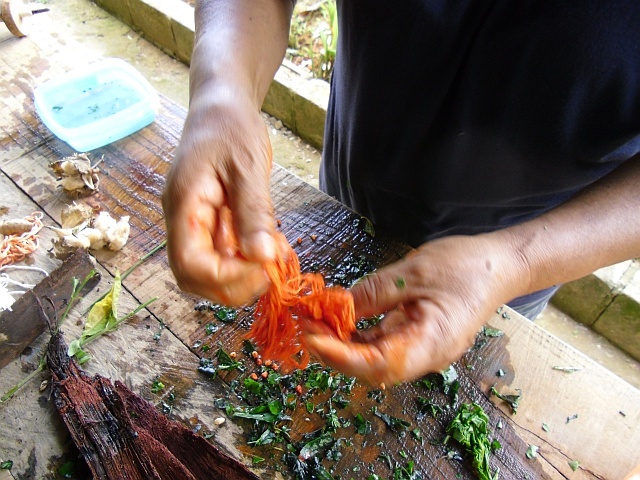 The dyeing of the yarns involved collecting various natural items such as leaves, barks and roots. Fires were built to heat large pots containing water to boil the dyeing materials. It took many hours with much stirring. Then the wet yarns were removed to an area to dry. After spinning the yarn, which is hard on the hands, the weaving begins. Beating the weft into the warp for a tight weave uses a lot of back and shoulder muscles. Did anyone complain? It was all part of daily life in the village. Until the opening of the Pan American highway in the 1960’s, Boruca was always self-sufficient. Only recently in the last few decades things began to change. The children are learning of different life styles, more modern and easier. Young adults are now schooling for more years, going to university and learning other trades to earn money. Clothing is now bought in stores making spinning, dyeing and weaving a dying art. Hardly anyone wants to physically work as hard as grandma! In the 20 years Boruca Gallery Gift Shop has been selling the beautiful handcrafted woven items, each year less and less are being produced.